Now that is adorable and perfect. soooooooo cute. where did you find the pattern? I was just coming in to ask that question. Thanks Becky, for putting it up for me. This week has been trying to say the least. I'm so glad you liked it. 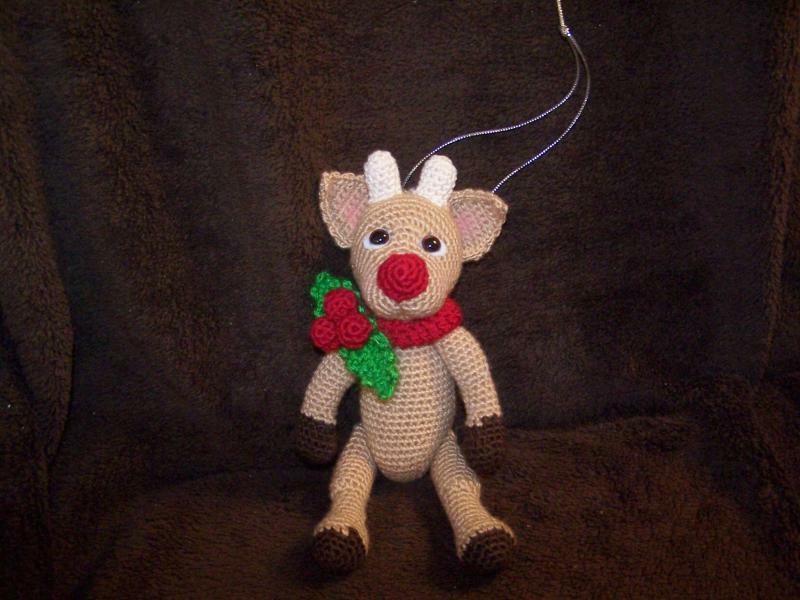 When you said whimsical- Rudolph, Frosty and the baby New Year came to mind. I scoured the Internet for something that would work and when I went on www.stuffthebody.com, I knew her Andy the fawn pattern was perfect. Her fawn body proportions were so close to a real fawn and her technique of working it all as one piece makes it work up quickly and leaves hardly any ends to weave in. 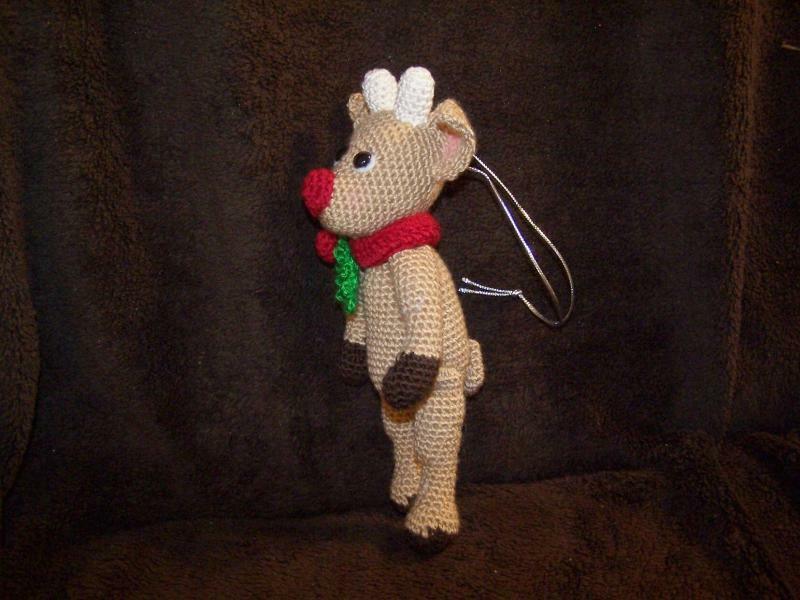 I made mine in thread, making it perfect ornament size and I added my own finishing touches by adding my own nose and changed the antlers. I would have started the ecru a little sooner in the nose area but it was the first go at that pattern. 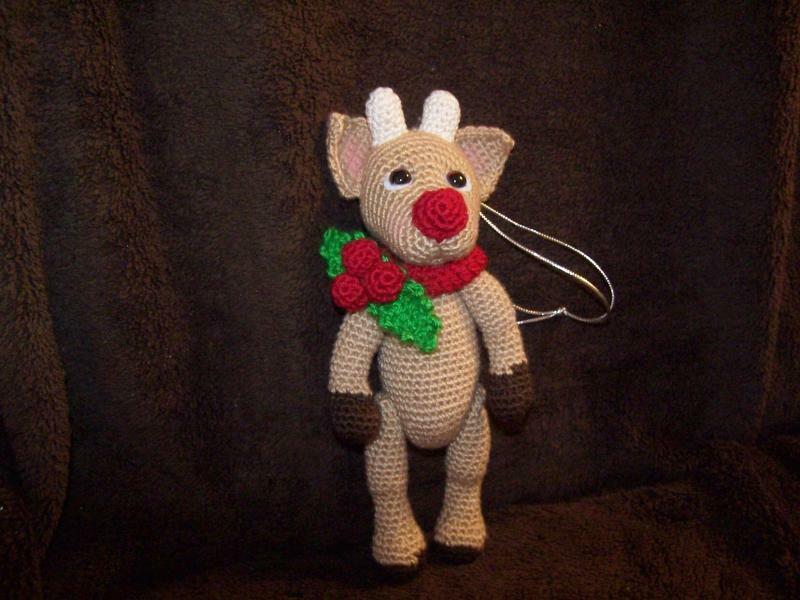 I was going to give Rudolph a collar of tiny bells all around his neck, but for some reason, I chose to make a removable wreath. BeckyB mailed mine out and it is estimated to come on Monday!!! I am so excited! #1Crochetfan's ornament is out for delivery!!!! :yay Yes, it did get here. I'm glad you like him. I did have to chuckle when I opened mine, knowing I sent a Rudolf too, lol. It was fun being partnered with you! He is adorable and that is so funny that you both made reindeer. Sounds great...yours is going out today. I have not yet.. Mom4x messaged me & I should get it this week!